According to a new study by Dartmouth College, female politicians with more feminine features tend to win elections, while those with more masculine features tend to lose. This is independent of other characteristics that have always been thought bear on a candidate's success, such as her competence and attractiveness. The femininity was assessed by 300 participants in the study, who were shown pictures of Senate and gubernatorial candidates between 1998 and 2010. 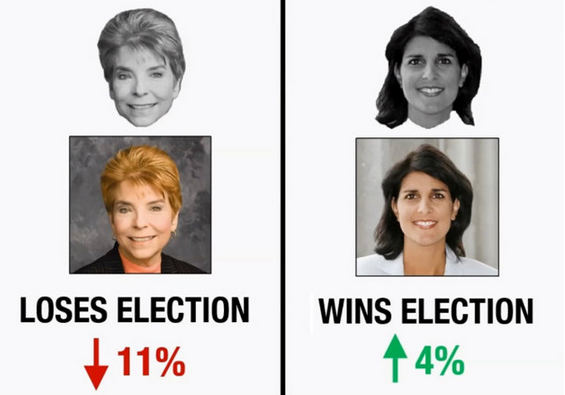 A video accompanying the study showed the two women above, Judy Baar Topinka, who was defeated in her run for governor of Illinois, and Nikki Haley, who became governor of South Carolina. What distinction did the authors see? "Larger eyes and rounded features convey femininity whereas lateral bone growth and prominent upper brows signal masculinity." Larger eyes and rounded features are features of youth. With age, fat in the lips and cheeks, which provides roundness, drains away. Noses and ears lengthen, making eyes less prominent. The differences between male and female faces naturally diminishes. Which means that, according to this study, the natural aging of a woman's face is a powerful factor against her in the eyes of voters.